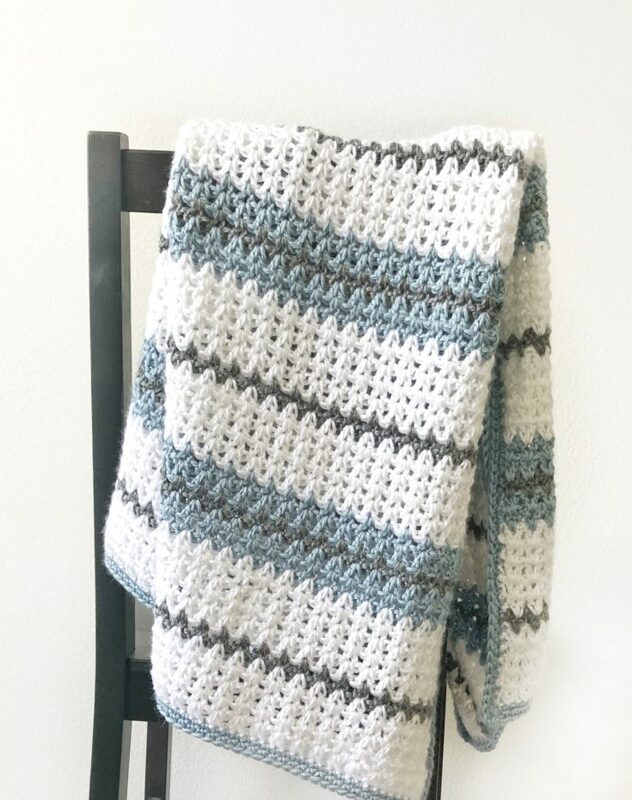 The Crochet Country Blues Baby Blanket uses the moss stitch and Caron Simply Soft in White, Dark Country Blue, Country Blue, and Light Country Blue. 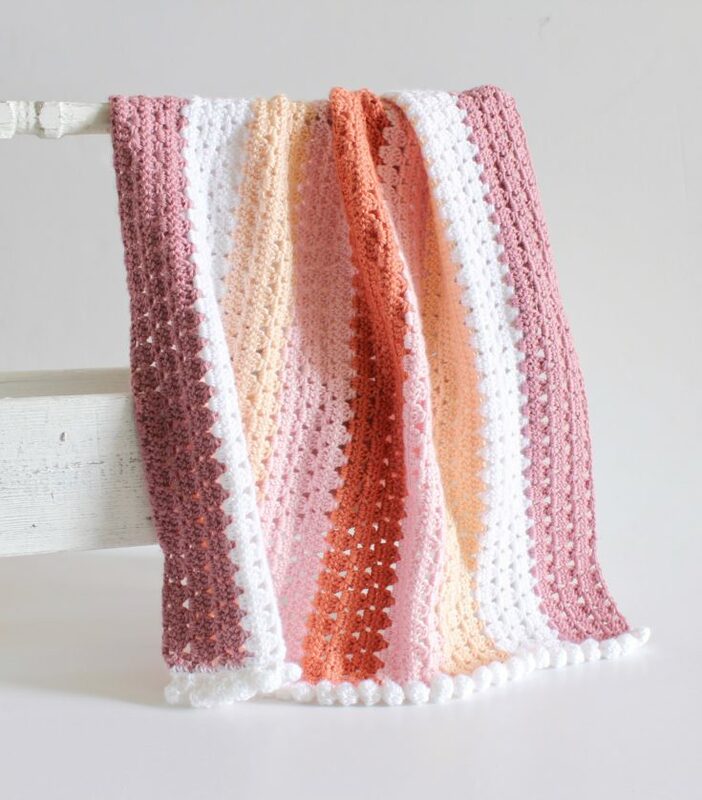 The Modern Boho Granny Blanket uses Caron Simply Soft in Plum Wine, Light Country Peach, Soft Pink, Pumpkin and White. The Crochet Boho Berry Blanket uses SC and the berry stitch with Caron Simply Soft in Plum Wine, Soft Green and Light Country Peach. 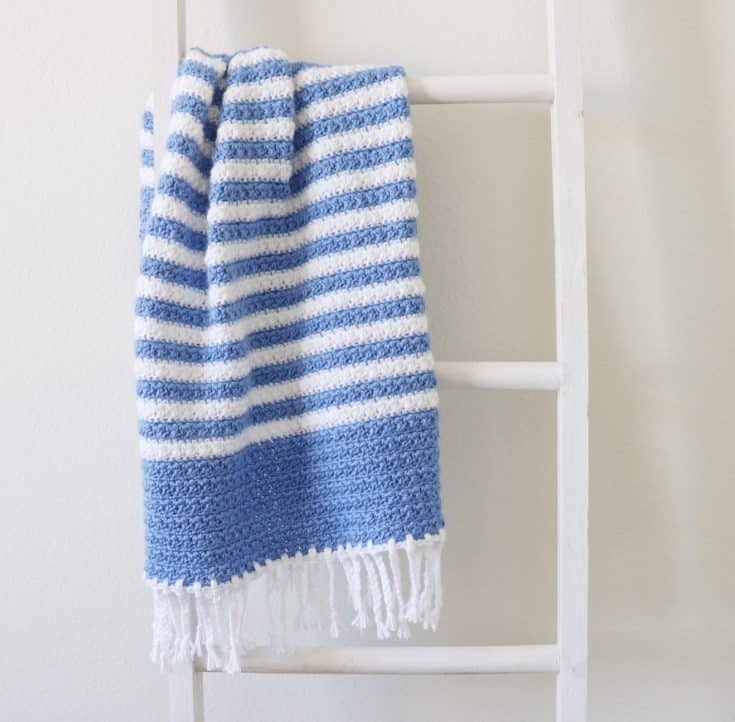 The Crochet Blue Stripes Baby Blanket uses the mixed cluster stitch with Caron Simply Soft in Berry Blue and White. The Crochet Block Diamond Blanket is made with HDC and Caron Simply Soft in White and Light Country Peach. 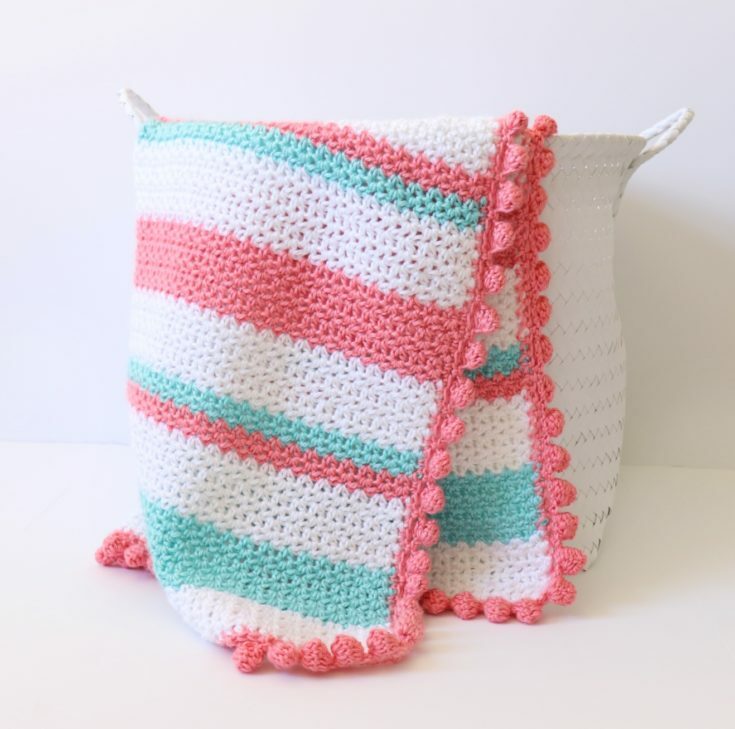 The Crochet Modern Granny Blanket is made with Caron Simply Soft in Light Country Peach and Soft Blue. 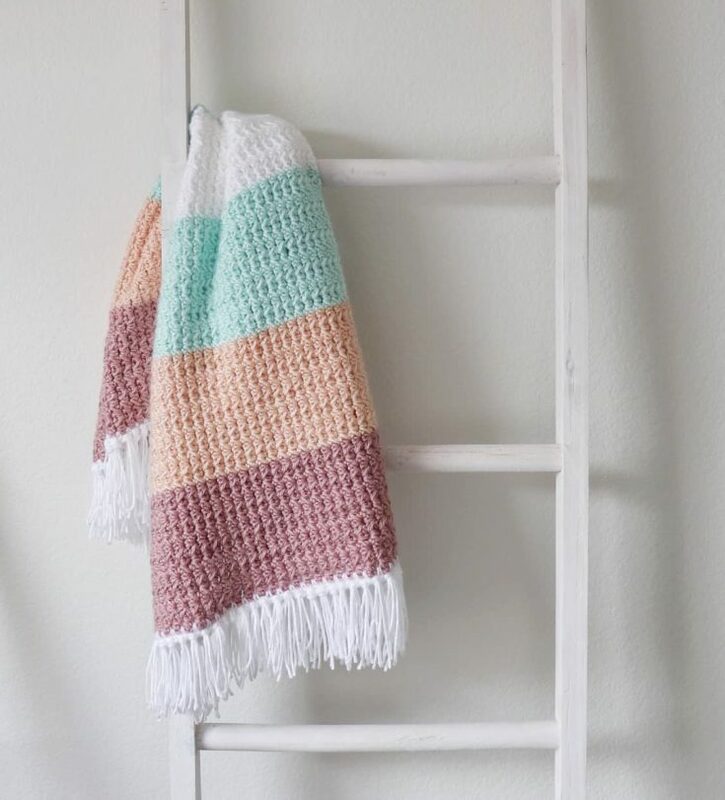 The Crochet Boho Color Block Blanket uses the modified daisy stitch with Caron Simply Soft in Soft Green, Light Country Peach and Victorian Rose. 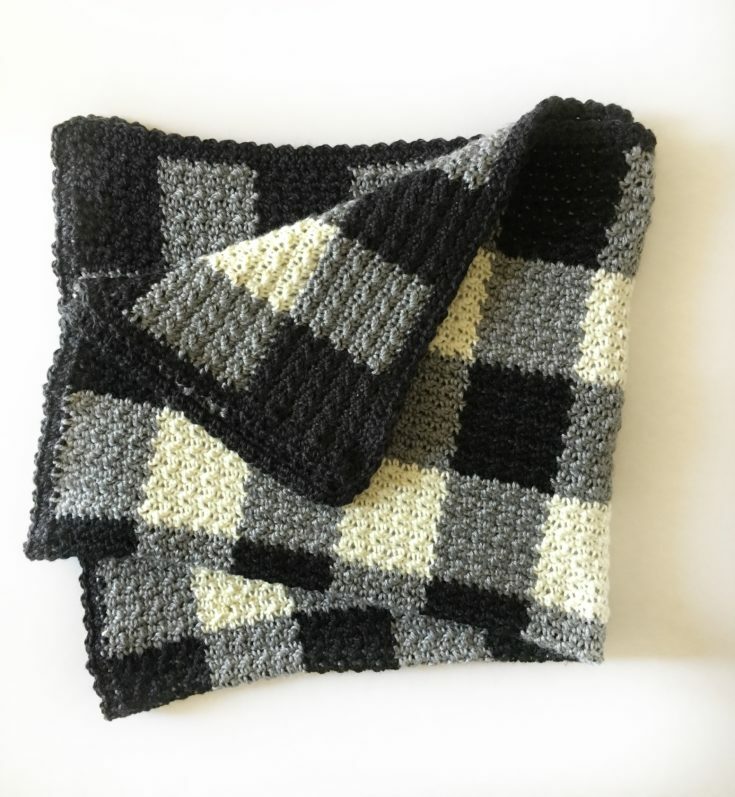 The Black Gingham Blanket uses the griddle stitch and Caron Simply Soft in Black, Grey Heather and Off White. The Crochet Moss and Puff Stitch Baby Blanket uses Caron Simply Soft in White, Soft Green, Strawberry and Grey Heather. 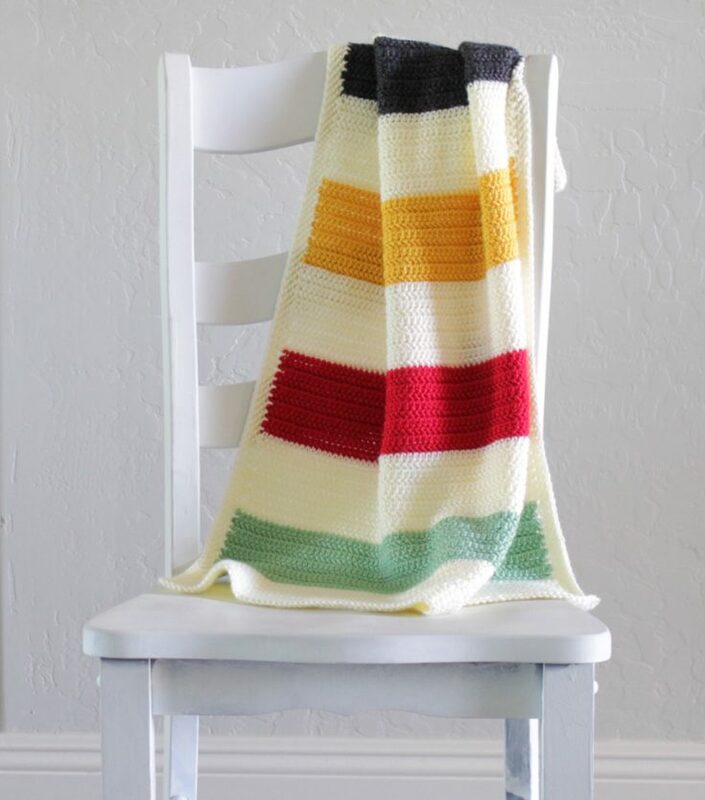 The Vintage Stripes Baby Blanket uses the herringbone HDC stitch with Caron Simply Soft in Gold, Heathered Charcoal, Sage, Off White and Autumn Red. 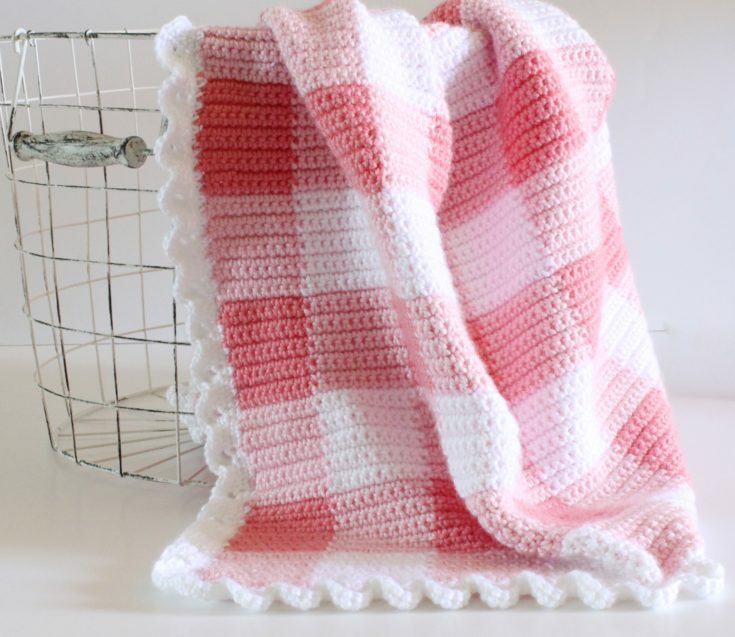 The Crochet Pink Gingham Blanket uses SC and Caron Simply Soft in Strawberry, Soft Pink and White. 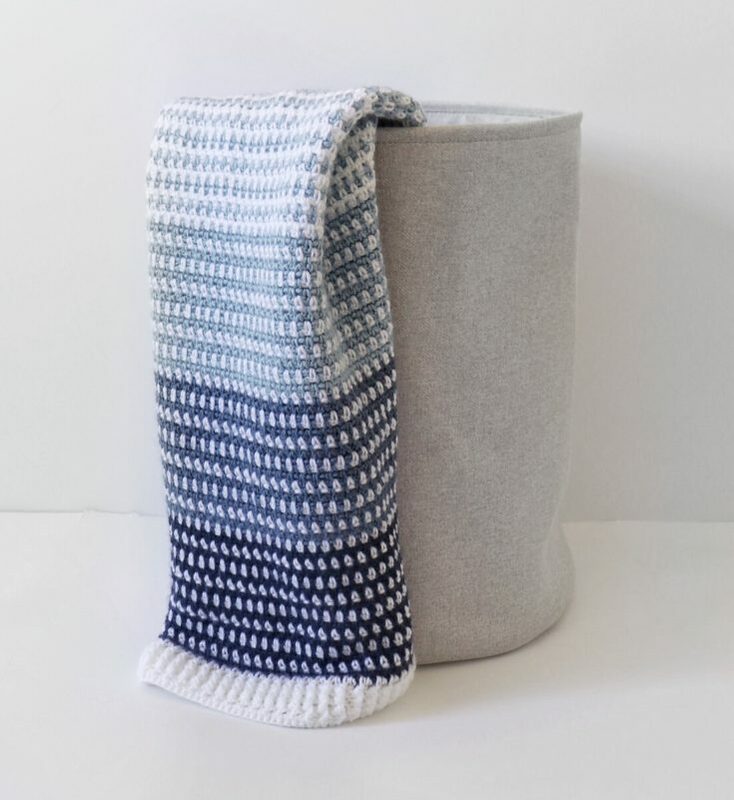 The Modern Double Crochet V-Stitch Blanket is made with Caron Simply Soft in White, Grey Heather and Light Country Blue. 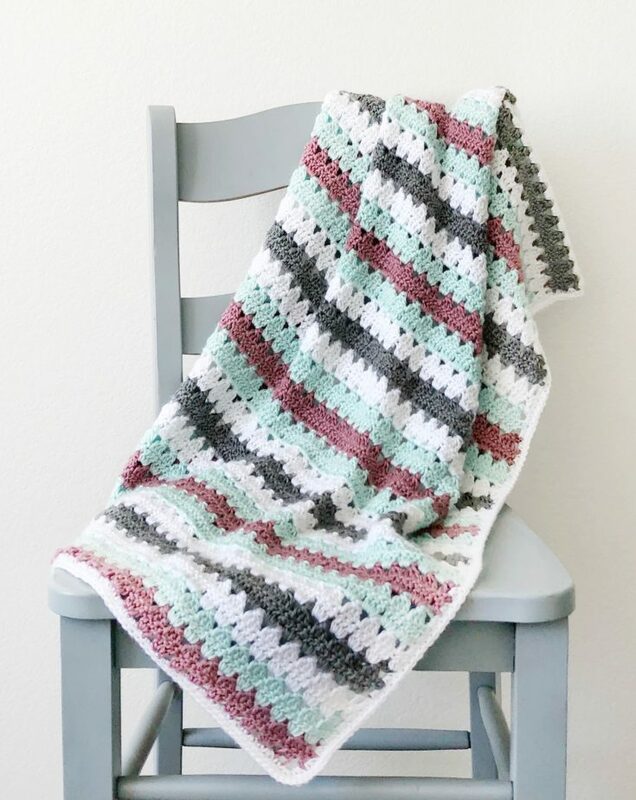 The Crochet Striped Modern Granny Blanket uses Caron Simply Soft in White, Grey Heather, Plum Wine and Soft Green. 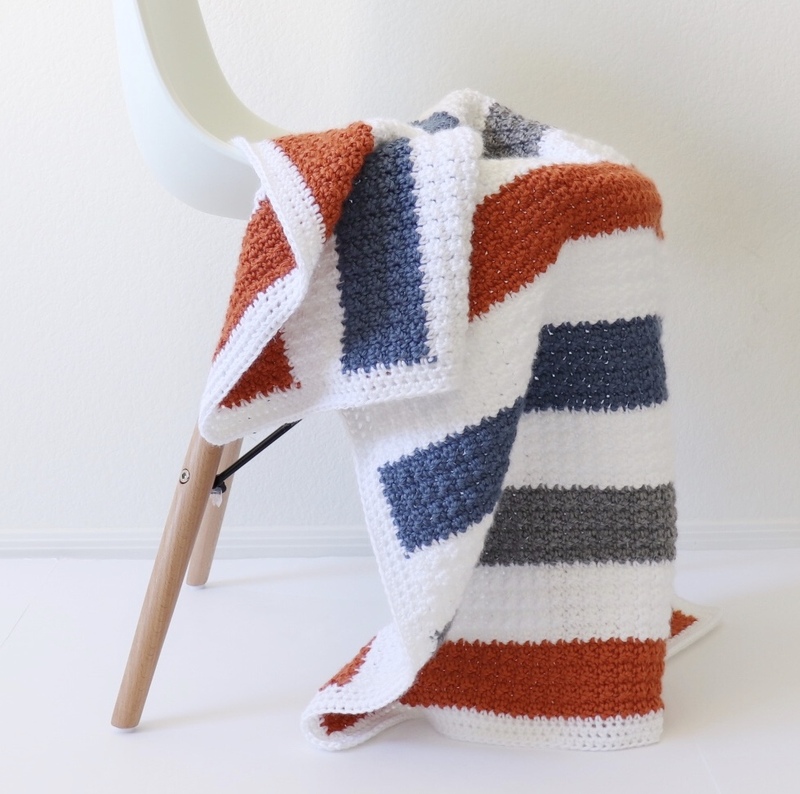 The Crochet Striped Crumpled Griddle Blanket uses Caron Simply Soft in White, Country Blue, Grey Heather and Pumpkin. 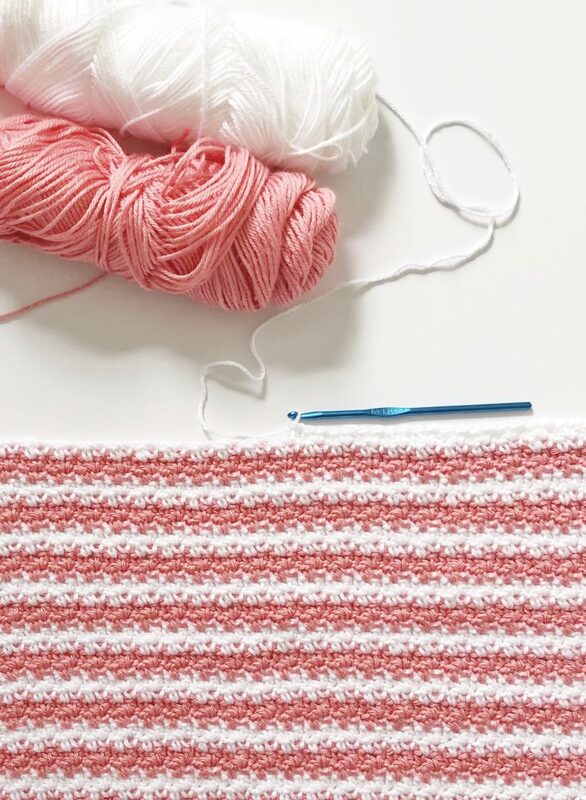 The Crochet Strawberry Stripes Baby Blanket uses the griddle stitch and is made with Caron Simply Soft in Strawberry and White. 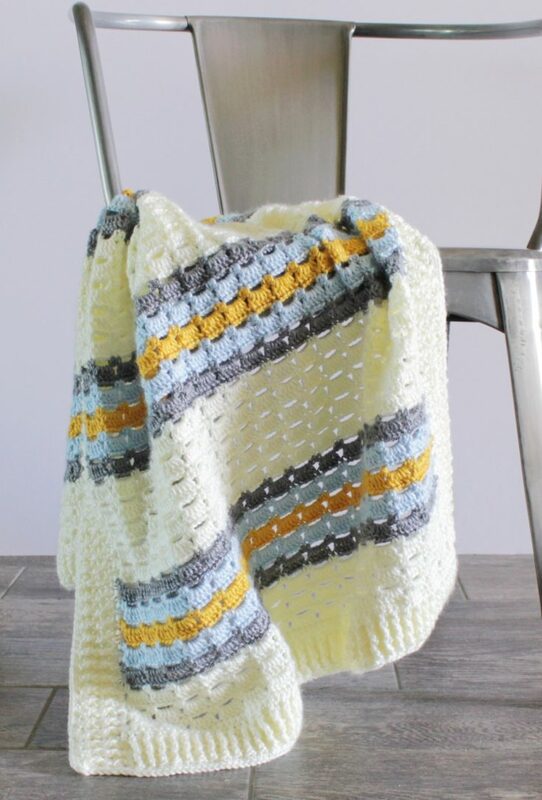 The Crochet Modern Nautical Baby Blanket uses the modified daisy stitch and is made with Caron Simply Soft in White, Navy and Soft Green. 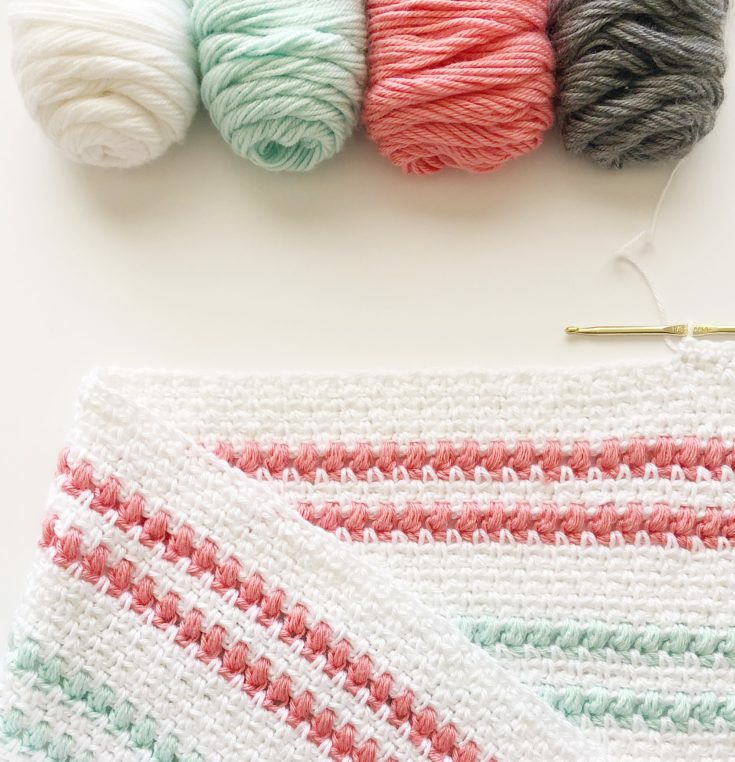 The Crochet Striped V-Stitch Baby Blanket uses Caron Simply Soft in White, Strawberry and Robin's Egg. 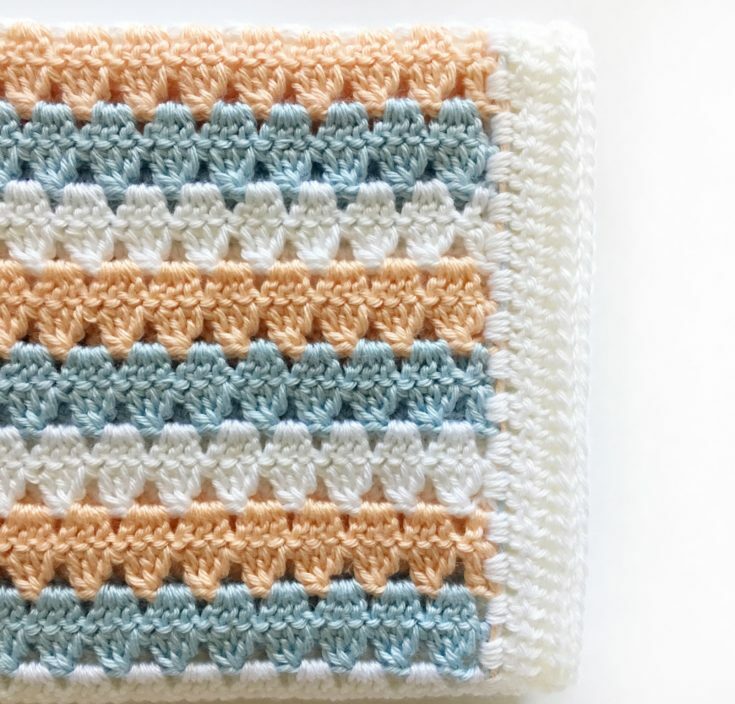 The Crochet Boxed Block Stitch Blanket uses Caron Simply Soft in Gold, Grey Heather, Soft Blue and Off White. The Crochet Woodland Heather Blanket uses the herringbone stitch with Caron Simply Soft in Black, White and Woodland Heather.